Africa, 1904: When German colonial authorities issue an extermination order, the Herero are forced to flee into the desert and seek safety in British Bechuanaland. Tjipuka, a young Herero mother, escapes the massacre with her baby but is captured and put to work in the death camps in Lüderitz. There she has to find the courage – and the will – to survive against all odds. The Transvaal, 1899: Riette’s nursing ambitions are crushed when she is forced into marriage with an older neighbour. When he is taken captive and their farm is set ablaze during the Second Anglo–Boer War, she and his daughters must face the horrors of the British concentration camps. 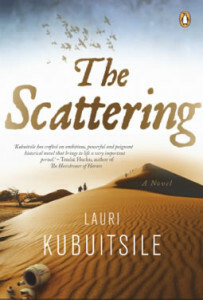 Against the backdrop of southern Africa’s colonial wars at the dawn of the twentieth century, The Scattering traces the fates of two remarkable women whose paths cross after each has suffered the devastation and dislocation of war.